Cute Babies WebRing is a ring of sites ranging from baby names, toys and gifts for newborn baby boys and girls, baby clothes, baby poems, pregnancy, doulas, childbirth and more. All baby sites are welcome to apply for membership of this ring. This ring will maintain a 100% uniqueness rating so single membership is strongly preferred. Sites holding membership of any other webring may be removed. The FIRST Babies Only Web Ring! These sites are for Baby exclusively and only! These are primarily commercial sites that sell things useful for your baby. A comprehensive parenting webring offering great parenting tips, pregnancy advice, bulletin boards, chat areas, articles by experts, games, merchandise, surveys and more! Member sites offer parents and families, among other things, guidance and valuable tips and hints on childrearing, child safety and childbirth. They sponsor shopping sites for children's, boys' and girls', apparel, toys, games, books and furniture. In addition, we have members specializing in educational material and software. Parents 'n' Kids is a fantastic place for mothers, fathers, and grandparents to gather and to shop. This ring consists of pages dedicated to our beautiful girls! Homepages dedicated to our precious daughters are included, along with birth stories pages, and other related sites. This WebRing is for anyone that loves their Baby! IT'S ALL ABOUT BABY! Members sites are a collective of personal homepages including but not limited to helpful informational sites, baby names, developmental milestones, and ahhhhh, sleeping through the night. Another webring where parents can brag about the love of their lives, the children. From conception through childhood, we have all the little darlings on the web! 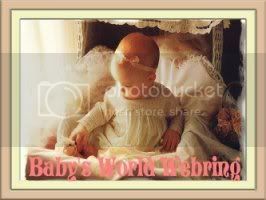 This webring is for parents with pages about their babies or children. The ring is also for any kid-safe pages by kids or for kids. Obviously all sites must be family-safe. The webring ssnb code must be placed on the submitted page; if this is a webring page, there MUST be links to that page from your site. Sites which clearly state their relevance to this ring will receive a higher listing in the ring. Also, sites which proudly display the webring will receive higher listings than those who try to bury the code where no one will ever see it. If you want to receive traffic, you have to be willing to give it back too! Business sites are welcome as long as they have baby-related products. A collection of sites related to babies, kids, and even pregnancy! Personal and commercial babies and children oriented web sites! Point your browser to our WebRing for a tour of wonderful sites featuring babies, kids, and pregnancy along with the parents! It's ALL ABOUT BABY! Members sites make up this precious collection of personal homepages including baby names and baby pages in general.